A transform file is an XML file that specifies how the Web.config file should be changed when it is deployed. Transformation actions are specified by using XML attributes that are defined in the XML-Document-Transform namespace, which is mapped to the xdt prefix. 1. Locator - The Locator attribute specifies the Web.config element or set of elements that you want to change in some way. 2. Transform - The Transform attribute specifies what you want to do to the elements that the Locator attribute finds. The root element of a transform file must specify the XML-Document-Transform namespace in its opening tag, as shown in the preceding example. The Locator and Transform elements themselves are not reproduced in the deployed Web.config file. If you are deploying to a ASP.Nete Web Site, and if you want to transform settings in the appSettings or connectionStrings elements. Each of the following sections explains the syntax for one Locator attribute. Specifies an XPath expression that is appended to the current element's XPath expression. Elements that match the combined XPath expression are selected. This expression is a result of combining the implicit XPath condition for the current element (configuration/connectionStrings) with the expression that is specified explicitly. Locator="Match(comma-delimited list of one or more attribute names)"
The following example shows how to select the same elements that are selected by the preceding example for the Condition keyword. Each of the following sections explains the syntax for one Transform attribute. Inserts the element that is defined in the transform XML directly before the element that is selected by the specified XPath expression. The XPath expression must be an absolute expression, because it is applied to the development Web.config file as a whole; it is not appended only to the current element's implicit XPath expression. The following example shows how to select the deny element that denies access to all users. It then inserts an allow element before the deny element in order to grant access to administrators. Inserts the element that is defined in the transform XML directly after the element that is selected by the specified XPath expression. The XPath expression must be an absolute expression, because it is applied to the development Web.config file as a whole; it is not appended to the current element's implicit XPath expression. The following example shows how to select the allow element that grants access to administrators, and inserts a deny element after it that denies access to a specified user. Removes the selected element. If multiple elements are selected, removes the first element. The following example shows how to select all the connection string add elements in the development Web.config file. In the deployed Web.config file, only the first connection string element is removed. Removes the selected element or elements. The following example shows how to select all the connection strings in the development Web.config file. In the deployed Web.config file, all the elements are removed. Removes specified attributes from the selected elements. Transform="RemoveAttributes(comma-delimited list of one or more attribute names)"
The following example shows how to select all the compilation elements in the development Web.config file. (Because there can be only one compilation element in the configuration file, you do not have to specify a Locator attribute.) In the deployed Web.config file, the debug and batch attributes are removed from the compilation element. Sets attributes for selected elements to the specified values. The Replace transform attribute replaces an entire element including all of its attributes. In contrast, the SetAttributes attribute enables you to leave the element as it is but change selected attributes. If you do not specify which attributes to change, all of the attributes that are present in the element in the transform file are changed. The SetAttributes transform affects all selected elements. This behaviour is different from the Replace transform attribute, which affects only the first selected element if multiple elements are selected. Transform="SetAttributes(comma-delimited list of one or more attribute names)"
Locator attributes are optional. If you do not specify a Locator attribute, the element to be changed is specified implicitly by the element that the Transform attribute is specified for. In the following example, the entire system.web element is replaced, because no Locator attribute is specified to indicate otherwise. A Transform attribute does not have to be set in the same element as a Locator element. You can specify a Locator element on a parent element in order to select elements whose child elements you want to work with. You can then specify a Transform attribute in a child element in order to apply a change to the children. The following example shows how to use the Locator attribute to select location elements for the specified path. However, only elements that are children of the selected location elements are transformed. If you specify a Locator attribute but you do not specify a Transform attribute in the same element or in a child element, no changes are made. Note: A Transform attribute on a parent element can affect child elements even if no Transform is specified for them. For example, if you put the attribute xdt:Transform="Replace" in the system.web element, all the elements that are children of the system.web element are replaced with the content from the transform file. In this post, you can learn about how to use WebApi with MVC and jquery. I have defined get, post, put and delete methods using model class to use it in jquery at client side and MVC controller. ASP.NET Web API is an ideal platform for building RESTful applications on the .NET Framework. We already know about WCF services and web services that both are soap based services and they use HTTP as the transport level protocol. That means they use HTTP protocol just to tunnel the soap messages across the internet. But all clients are not handled to suitable the soap messages. SOAP messages are internally XML and handling XML which might be complicated for some clients. And the best example non soap based client is JQUERY. Now to overcome this problem we introduced WCF rest services. If you are conversant with REST, please go through WCF REST services site and first learn it there. REST is an architectural style which says to use the existing features of the web in a more efficient and simpler way. If you want to know about the features and to learn them, those are HTTP verbs like GET, POST, PUT and DELETE. In REST, every stuff is unique to identify, not always in XML for communication you can pass XML, JSON so on. Use this feature for this we are calling HTTP rest service. For use of WCF rest service, it requires lots of configuration settings which is a bit complicated. The main intention behind services is building service oriented architecture not to support REST. Now Microsoft simplified this and finally it came with the solution, created part of ASP.NET called ASP.NET Web API. It is part of ASP.NET technology for creating REST services. With MVC 4 application with selection of Web API Template, this includes a sample web API call ValuesController. Here you will find lots of features which are the same as MVC. It means not exactly the same but its code patterns are similar. If you are not an MVC developer, these things may be difficult for you; otherwise it's very easy to understand. Let's discuss something about this. 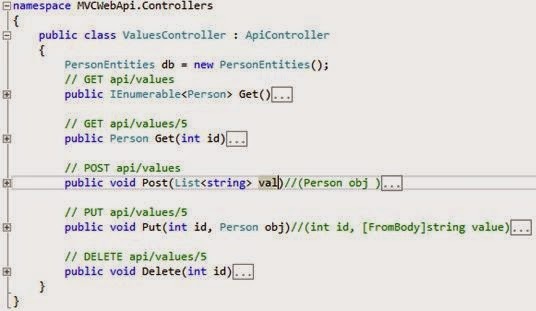 In MVC, there is an added MVC Controller whereas in web API, there is an added API controller. In API controller, action methods are HTTP verbs like Get, Post, Put and Delete even we can overload this methods. Just like this in WebApi default name is DefaultApi. Just to keep separate with MVC routes web API routes template defined first is API. We can change it to customerapi, facebookapi so on as per our requirement. Next is controller and id option RouteParameter. The main thing is that it doesn't have action here; we only have HTTP methods depending on client requirements. If it is a get request, the get method will call and post request, then post method will call and so on. Let's create a Person class inside model folder. As per the API, my API controller name is Values on top of the picture. I have changed instead of returning string changed to person list. I have commented the default return values. I have also added PersonEntities where I have defined it in model class. When you will run the application, browse through the ../api/Values/ you will get data with XML in chrome browser. You can get JSON representation of data from request of get method. For this, I have designed it in Index2VIEW page. This is just as content negotiation. Depending on the client request, it returns the data. When client says XML, it returns XML and JSON even say we return our own custom format like visiting card, class or anything. In this above code, I have collected JSON data by the code of JSON format and designed it to our HTML page. One of the things we can show as MVC format by the call of Web API get method where you will get complete information to view the downloaded project. if you will run http://localhost:49493/api/Values in chrome browser then get to see like below image. It will return HTTP XML values. Now, we will write a code which will consume the web API by the way of JQuery and MVC. Now I am writing a post method in Web API to insert data.